Lindzen: Understanding The IPCC AR5 Climate Assessment | Watts Up With That? The IPCC makes carefully crafted statements that are easily misinterpreted by the faithful. I’ve encountered dozens of activists and true believers so far who have seen the statement about increased certainty regarding human influence on the climate and clearly read into it that this that it refers to some kind of imminent fire and brimstone Armageddon. The usual good sense, and good prose from Prof. Lindzen. How many of our politicians will read it is another matter. Things in the UK will only change when winter blackouts start occurring, possibly 2014-15. About the “pause”, who invented the pause and has global warming really paused? Common rebukes of Dr. Lindzen are the typical “big oil”, “liar” blah blah blah. You see he is a scientist but to the CAGW believers, he is anti science. UNFCCC and IPCC was established in the aftermath of western world Reagan and Thatcher liberalisme. It’s more about saving the leftist ideology and solutions than climate and environment. Please don’t jump on that. If you take last year’s storm-induced low off the chart, this year’s JAXA is indistinguishable from natural variability on the steady down trend. Sudden surprising growth can be claimed the next time the yearly low comes in higher than the 1990s average low. At that point global warming (with or without an A) would be dead, dead, dead. Here, here! The IPCC is manufacturing science which is highly political and is designed to ‘make lies sound truthful’. Clear, concise and direct (as usual). Just a wild and crazy guess: mother nature invented the pause. And don’t come back some other day. Your essay is wonderful. Thank you. For actions to be considered moral it is not even necessary, much less sufficient, to have ‘transcendent aspirations’ at all. Global warming is supported (à la IPCC) by an irrational conception of science defined as a pragmatic tool useful only to support the needs of ideology. That is the new conception of science in the world of post-modern philosophy; the IPCC is its prototype. @ Dingo. Really? Mother Jones? it’s laughable, but, then having a leftist rag even to pretend a passing knowledge of statistics is laughable. As to the vacant step graph put out by SS, there’s a couple of things funny about it. First, they used a data set they themselves were critical of, and they created it even before it passed peer review! Also, have you looked at the duration of those steps? None are anywhere close to 17 years. Dingo, did you actually believe the tripe about starting at 1998? Did you bother to check? As far as who invented it? You needn’t look any further than the lunatic alarmists who paraded the temp record every time an El Nino occured as proof of global warming. Including the grand year of 1998. Nature invented the “pause”; NASA, NOAA, the Met Office & every other relevant national & international organization has observed it. If Mother Jones hasn’t gotten the news, then they should contact Dr. Phil Jones, former director of inept T data gate-keeper HadCRU & infamous co-conspirator revealed by Climategate, who never the less to his credit admits that there has been no statistically significant warming since 1996, not 1998. Remains to be seen if the pause is that or a plateau before a drop, as after the 1920s-40s warming spell, which showed the same slope as the 1970s-90s interval. Why is it that I never hear any ideas on how to mitgate what is already in the atmosphere rather than ideas to mitigate what we are about to send there? If things are so dire we should concentrate on getting rid of the cancer not worrying about how we got it and whether or not we should stop smoking some time in he future. There, fixed that for ya, Viktor! I love this phrase: “…The IPCC iconic statement that there is a high degree of certainty that most of the warming of the past 50 years is due to man’s emissions is, whether true or not, completely consistent with there being no problem…”. Solidly in agreement with Dr. Curry’s similar observation about IPCC’s supposed increased ‘confidence’ in man caused AGW. I don’t see anything like that in the data. Yes, this one year the ice was higher than expected but it’s a bit early to make a trend from it, One year ago it was lower. When I’m looking now at data from and since 2007, I can tell that the descent did not stop by then. What’s happening right now, we’ll see in 5 more years. Hardly sooner. Both possibilities contradict alarming claims. Dingo, the “pause” was invented decades ago by none other than Coca-Cola. They ran a very long ad campaign under the slogan, “The Pause that Refreshes!”. Who would have suspected that such a neo-Fascist, right-wing, capitalist outfit like Big Coke could have been so prescient? I have a problem [as does Dr Lindzen] with the word “pause”. Something can only be labeled a ‘pause’ if it resumes. But at this point, global warming has stopped. Global warming may resume. Or not. But to call it a “pause” is disingenuous. It is a baseless assumption, intended to convince readers that it is only temporary. Maybe so; maybe not. There is a non-zero probability that global cooling will commence, but that is never mentioned. Dr. Lindzen poses a plain and simple challenge for the IPCC. He explains that their positions on the science do not support their claims about the dangerous consequences of manmade global warming. The ball is in their court. They must show that their scientific claims do support their claims about the dangerous consequences. I wonder when the IPCC will respond. Can some supporters of the IPCC give us some insight into the timing of the IPCC’s response. Please don’t jump on that. The BS kiddie arguments should be left to the warmists. Mars an otherwise good essay. Several experiments and pilot projects have been tried at Carbon Capture and Sequestration. All have proven to be too hideously expensive to even attempt to implement on the scale projected to be required. I question the need to even contemplate it. And I find the cancer/tobacco analogy offensive. If capturing CO2 from stack gases with a concentration at 11% is already unaffordably expensive, how much do you suppose it would cost trying to remove it from a gas stream containing 0.04%? Chris Mooney should learn to do some solid background research. Here are the inventors of the pause, the climate scientists themselves! No need to blame sceptics. We have “waited a bit”. The pause is now 15 years long and such events are rare in the output from climate models. For lack of significant warming, instead of 1996 I should have said 1995 as per Phil Jones & Mother Nature, as opposed to Mother Jones. Isn’t it time we lift the mask(s) off the IPCC Wizard Of Oz .No one that lies this big should get away with it . Yes …this is an Oz hunt but it is long ,long overdue. The missing energy hiding in the deep blue sea seems like a good plot for the next Pirates of the Caribbean sequel. Rescuing the missing heat from that dreadful hoarder Davey Jones will be a challenge for the usual suspects so it should be entertaining. As an ironic counterpoint, it could then just disappear back into space and go back to the stars whence it came once released from Mr Jones’s clutches. As is said here in Australia about such things, you know it makes sense. my first memory of official recognition was by Hansen who, having admitted publicly that the models were not up to the job, thought it was the aerosols wot dunnit . That was a few years ago now. I always wonder why most people go to dry warm places for holiday or retirement . I also never understood why rain is bad weather and what exactly is extreme weather. The same weather can be fun or misery depending on in what family you were born. If the IPCC position can be distilled into, “We are 95% certain that human emissions of CO2 mean very modest warming in addition to natural cycles, with the likelihood of climate catastrophe being highly unlikely and there being no increase in extreme weather events.” Then I am inclined to agree with them. The more I read both the summary and the reaction to it, this is what I see in it. The passages which are alarmist, have no scientific basis in fact as the measured data clearly falsifies CAGW. The overwhelming evidence derived from measured data, (not taken from, nor filtered through models) suggests that a very modest warming, (and mostly beneficial) not outside the boundaries of natural variability, is the most likely outcome from human emissions of CO2. They were careful to write it to make it look far more alarming than it really is. Lindzen’s points are good ones. Penetrating and informative. Calmly reasoned and presented. They deserve to carry more weight with politicians than the entire set of WG1 reports and all of the highly-spun SPMS. The problem is that people of the mentality seen at the IPCC simply will not acknowledge that there is any other point of view besides theirs. It isn’t even that they do not deign to respond, for them it doesn’t even exist – even when the evidence slaps them upside the head. The first principle of ideologue belief systems is not merely ignore any countervailing evidence or opinion, it’s that no such evidence or opinion exists. The IPCC will continue to publish its rubbish and be 99 percent or whatever confident that man’s activities are burning up the Earth even as the nexrt ice is descending upon us. Beautiful and succinct summary of the sceptics’ arguments. Should be made a sticky for a couple of days. Due to fortunate stretch of more positive NAO conditions. Though with this weaker solar cycle we should expect more summers with negative NAO conditions like 2007 and 2012 and greater reductions in summer ice extent again. This makes me wonder what happened to CG3. I greatly admire Richard Lindzen. Not only does he make sense, but the man writes like an angel. I love the latest nonsense about the “hidden heat”. Where is the hidden heat really hiding? Well put and should of course be headline news…but it’s not. We all know why…it would be the end of a religion, a way of life and taxation and the beginning of the litigation against the shysters! That would be around an extra 2.5 W m2, or around 0.7 deg C with no feedbacks and aerosol fudges. 2 deg C with feedback, where is the 1.3 deg C? No wonder people are becoming suspicious, in light of the hiatus. Thanks Dr. Lindzen for your clear assessment of the actual SCIENCE (and the lack thereof)! Assuming that 17 years ago ‘greenhouse’ heat suddenly decided to stop warming the atmosphere and began hiding in the ocean, shouldn’t there have been a sudden acceleration in sea level rise? Based on prior history, I think we can all write summaries for AR6 already. I love Richard Lindzen. His droll delivery is fabulous in hammering the nail directly on the head. He never waivers. This time is no exception. If the oceans are absorbing heat now, how much of the rise during the 80s and 90s was due to the oceans releasing heat? Dr. Brown had a post a while back about the models. Part of that post was about how the IPCC should start throwing away those models that have overshot temperature and narrow the results down to the closest. Can we do the same with the scientists in the IPCC? Those that have consistently been wrong, consistently claimed extreme events are still in the IPCC. Lindzen, or Spencer, or many others have consistently been right about climate sensitivity and extreme events and the non-event that “climate change” will be yet they are left as outsiders. It makes no sense to discount those that continue to be right in favor of others who have proven to be wrong. First read this as “…all models show greater tropical warming than has been observed since BEFORE 1978…” Does Lindzen mean “…all models project greater tropical warming from 1978 on than what actually has been observed”? Yes. The GCMs show warming that has not been observed, in particular the phantom “Tropical Tropospheric Hot Spot”. No, religions never die. They just beat you over the head more strenuously, and get offended when you point out how silly they are. @Dingo – Mother Jones? LOL – what next? SkS? Please! Been a rough week at work, I need more laughs. Here is a statement made that describes his feelings about doubling CO2. I’ve read Lindzen’s work. I do not want to put words in his mouth, and do not know if this is accurate: He has said that even the IPCC admits that a doubling could by itself cause 1C warming. But I do not think he believes there is proof of that, thought the upper limit of warming may be that amount. Again, someone is claiming 17 years of no warming. All one has to do is look at a major global temperature index. It becomes easy to see that the brief spike of the 1997-1998 El Nino is an extreme El Nino spike, and the hiatus started about 12 years ago. I don’t see anything like that in the data. The JAXA is showing a sharp rise since the low. If it stays on course, it will cross the 2000 average in 6 to 7 days. If it doesn’t slow down it could also reach the 1990 average by the end of this month. The IPCC iconic statement that there is a high degree of certainty that most of the warming of the past 50 years is due to man’s emissions is, whether true or not, completely consistent with there being no problem. Brilliant! Thank you, Dr. Lindzen, this is an excellent contribution to the understanding of the AR5. However, there is another answer which is hinted by your final paragraph. Alarmists invented the “pause” as a method to avoid admitting that global warming has stopped. Again, someone – in this case, you – is trying to claim that discernible global warming did not stop at least 17 years ago. But, it did according to all the global temperature indices (i.e. HadCRUTn, GISS, RSS, and UAH). To save people needing to use the link, I copy that reply to here and add two clarifying sentences. Any model of change could be used but ‘climate science’ uses linear trends, so that is the appropriate model. All the available time series of global temperature show no discernible global warming or global cooling at 95% confidence for at least 17 years. RSS shows no discernible global warming or global cooling at 95% confidence for 22 years. But they each do show discernible global warming at 95% confidence for the previous 17 year period. In other words, all available time series of global temperature show discernible global warming stopped at least 17 years ago. Excellent point, thank you Richard. I (we) stated in a Calgary Herald article published in 2002 that global cooling would commence by 2020-2030. My “climate heresy” of 2002 was based on the belief that the modest global warming observed since ~1975 was primarily natural and half-cyclical, not significantly humanmade, and would be followed by a half-cycle of natural cooling that would overwhelm any humanmade warming, real or imaginary. The timing of this prediction was based on the Gleissberg Cycle of 80-90 years duration, and cooling would occur one full Gleissberg Cycle after the previous global cooling period began circa 1940. I recall questioning my friend Dr. Tim Patterson at the time as to whether the shorter PDO cycle (of about 60 years) was a better estimator, and he thought not, based on his research. If indeed the PDO is a better estimator, then global cooling has probably already begun. However, these issues are usually best analyzed after a few years more data – we’ll see. The other input factor was that circa 2002, Solar Cycle 24 was predicted by NASA (Hathaway et al) to be robust, and in fact it has turned out to be a dud, similar to a Dalton Minimum. This reality could also support a return to global cooling sooner than 2020-2030. In fairness to Tim, our conversation took place during a brief phone call – the total duration of that call was probably less than 20 minutes. I am providing all this detail to show the dichotomy between the millions (or billions) spent on the computer climate models cited by the IPCC that produce nonsense, and an alternative free hypothesis that may indeed have some predictive value – again, we’ll see, but after 11 years we have a much better predictive track record than the IPCC. Yes, the term “pause” suggests that global warming will soon resume, after a “brief” hiatus of ALMOST 20 YEARS. I don’t think so. I think global warming HAS stopped. I think we will see some global cooling. I hope I am wrong, and if correct, I hope the cooling is not severe, because as a society, we do better in a warm climate and are ill-prepared for significant cooling. Whether this global cooling is reflected accurately in the Surface Temperature (ST) record remains to be seen, since there is a clear warming bias in the ST record. I will rely on the satellite record in the Lower Troposphere (LT) for my analysis. I suggest that the warmest decade in the last several hundred years in the USA was not 2001-2010, but rather the 1930’s. This may have also been the case on a global scale, since the global ST database is rather poor and spatial distribution is erratic. I also suggest that the Medieval Warm Period was warmer globally than today. In other words, there is nothing unusual going on in Earth’s climate, notwithstanding the huge increase in the combustion of fossil fuels and the observed increase in atmospheric CO2 (which may or may not be due to fossil fuel combustion). I suggest that the legacy of the global warming alarmist movement will be, at a minimum, the squandering of a trillion dollars of scarce global resources, and possibly a world unprepared for significant global cooling. Thanks for the post Dr. Lindzen. I always loving reading your stuff. I propose that we refer to the period of the past 17 years (and counting) of no warming as “The Halt”. The word implies nothing about the future, the way the words “pause” or “hiatus” do. It is a simple statement of fact. The Halt has thrown a monkey wrench into the Climatists’ plans. Their esteemed GCMs lie in ruins, and now all they can do is pathetically grasp at straws like “hidden heat” in the deep oceans. As we can see there was warming, it slowed in the late 1990s and turned to cooling around 2005. I would argue that the proper description of the 17 year “pause” is simply saying the trend is flat. Saying there was “no warming” is not really accurate. There was warming following by cooling. Think of it this way, if the cooling continues to around 2035 and the trend from 1975 is perfectly flat would it be correct to say there had been no warming? Clearly, there was. I think we are in a similar situation now where we only have 8-9 years of cooling. If we want to discuss 17 years then the proper description is a flat trend or, one I personally like, global temperatures have flat-lined. @Richard M, in 5 years time, a cooling trend will probably be discernible, and that will be more the focus. By then, Climatists will be reduced to the equivalent of flat-earthers. Hopefully, some will even be cooling their heals behind bars. re your post at October 9, 2013 at 5:31 am. With respect, you are assuming the trends are correct and have 100% confidence. But that is not so. If you apply 95% (i.e. ~2-sigma) confidence then your short trends are not discernibly different from zero (i.e. they do not indicate warming or cooling). And 95% confidence is the conventional confidence level adopted in ‘climate science’. Hence, your observations of apparent warming and cooling over short periods are not valid. Can anyone name a region of the earth that has become uninhabitable due to global warming? There are thousands of HOT places on earth where it is hard for humans to survive. Simply adding water to the soil makes them habitable. No amount of CO2 reduction would make them habitable. Consider Imperial Valley in California. Adding water to a hot, inhospitable climate has created one of the most productive growing regions on earth. Adding CO2 would simply make it more productive. Consider the middle east. Vast regions that are uninhabitable due to lack of water, so the people fight over what little arable land there is, and have been doing so for thousands of years. Governments call out for peace, and throw money and lives at the problem, when the solution is more water, not less CO2. Had the OPEC oil money been spent on irrigation rather than weapons, the peoples of the Middle East would now be facing a much different future. Sudden surprising growth can be claimed the next time the yearly low comes in higher than the 1990s average low. Until Chinese coal-fired power plants are subject to the same particulate emissions standards as American power plants, I’m not holding my breath for a recovery in Arctic sea ice. Mitigation policies appear to have the opposite effect without significantly reducing the hypothetical risk of any changes in climate. without a doubt. low cost energy makes modern life possible and with this has come a reduction in birth rates, stabilizing populations in the wealthy industrialized nations. In contrast, those nations with the lowest CO2 production generally have the highest poverty and the highest birth rates. so, while it may be argued that reducing CO2 will reduce the increase in temperatures, it could also be argued that it will increase birth rates in the poorest countries over what they would have been otherwise. so, in trying to curb CO2, we will end up increasing over-population problems. governments have nearly unlimited capacity to create big problems by trying to solve little ones. Attempted suicide is illegal. Governments solve the problem by executing anyone caught trying. A stark contrast to the thousands of academic hacks who played along the politically correct meme of AGW. Lindzen’s terminology ‘without warming’ is the most objective way to refer to the GASTA time series in the most recent ~17 year period. It is a reasonable strategy to use it and point out that it is unbiased as opposed to ‘hiatus’ or ‘pause’ or ‘temporary halt’ or etc etc. I do not recommend swatting at the swarming gnats who use the biased terminology, but at least skeptics should clarify and use Lindzen’s better terminology. Your essay stimulates ideas in a broader view of the climate dialog, as I have come to expect from you. Thank you. REQUEST => I would sincerely appreciate it if you or one of your direct associates at MIT or GWPF could point me explicitly to the ‘economic analyses’ to which you refer. I did notice that we have been having a strong ice year relative to recent years. I thought that I would wait a couple more years before deciding if it was meaningful. You ask, is there anywhere on the planet that global warming has made inhospitable? The correct term is “hiatus” = a period of time when something stops. “Pause” is emotive and suggests that we know that things will get started again. In this case, because we only have “medium confidence” in regards to cause of the hiatus, we can only have medium confidence that warming will start again, unless you stick to the underlying meme that temperatures must eventually rise due to the forcing from carbon dioxide. Which is a whole other argument. It seems to me that the IPCC report has decided to take a “bob each way” approach when you get to the detail, whilst the headlines continue to state emphatically that human induced climate change is clear, they seem to have chosen to be more equivocal in their detailed reporting. Unfortunately this has made the details of the report more opaque than it would otherwise be. My on-line dictionary definition of hiatus is a ‘pause’. It implies something temporary. In fact, global warming has stopped. It may resume, in which case we can look back and say that it paused from 1997 – 2016 [or whenever]. But since the late ’90’s, the rising global warming trend has stopped. Not trying to nitpick here, but any term that implies that the current non-rising global temperature [‘pause’, ‘hiatus’, etc.] is not permanent, is akin to predicting the future. Thanks, Dr. Lindzen. Very good article. I’m quoting two paragraphs from it in my climate and weather pages. In fact, global warming has stopped. It may resume, in which case we can look back and say that it paused from 1997 – 2016 [or whenever]. But since the late ’90′s, the rising global warming trend has stopped. I understand the political ramifications of the use of the word Pause. And I agree with how you look at this. But time scales matter. It’s not an “if” the temperature trend goes up in the future – but “when” the temperature goes up. We may not be alive – but someday the temperature trend will increase, maybe not for 120K years. Maybe it will go down for 20 or 50 more years and then stay there… but eventually, climate temperature will continue to change up and down. Yeash… arctic sea ice suddenly showing surprising growth??? Looks like you took that soundbite from the Daily Telegraph. Generally weak arguments based on limited evidence, but surely entertaining. Huzzah! Yes, of course I agree with what you wrote. I was objecting to the ‘spin’ terms used in the context of this discussion. Both “pause” and “hiatus” mean the same thing: that the current cessation of global warming is only temporary. In essence, they are predicting the future, no? As you say, temperatures will go up again, but we are not discussing geological time scales, we are discussing the IPCC’s AR-5 conclusions. The discussion concerns the next few decades, during which time global temperatures could rise, or stay the same, or fall. The implication with “pause” is the assumption that global warming will resume. That is not science, that is fortune telling. So please, let’s not let them get away with terms like a “pause” in global warming. Because right now, global warming has stopped. In case you haven’t noticed, Arctic ice cover has indeed risen over the past year, and by quite a lot. Antarctic ice cover also remains on its long term rising trend. How is that a “weak” argument? Instead of “The Pause”, how about using the term “Hiatus Hernia”? That’s actually funny. I think you are making a pun in referrance to Hiatal Hernia! This made me think of what it really should be called – Menopause. It’s not an “if” the temperature trend goes up in the future – but “when” the temperature goes up. We may not be alive – but someday the temperature trend will increase, maybe not for 120K years. Maybe it will go down for 20 or 50 more years and then stay there… but eventually, climate temperature will continue to change up and down. What are you basing that assumption on? True, we are now at a short-term peak of a long-term cycle warming up from the Little Ice Age. What evidence fo YOU have to support your assumption that the 1910-1915 slump -> 1940 peak -> 1970 slump -> 2000-2010 peak -> (probable) 2020 slump is going to continue into future increases? Why do you believe that the next bump in the 55 year cycle is going ever-and-ever higher than today’s 2000-2010 peak? Sooner or later the planet will become much colder. Glaciation will return. And since CO2 had no perceptible effect on temperature in past glaciations, it will have no effect when the planet inevitably cools again. Global cooling is the real problem. Humans do not have the energy necessary to prevent the planet from cooling. That is why the AGW scare is so ridiculous: they are worrying about the wrong thing. db: Sooner or later the planet will become much colder. Glaciation will return. And since CO2 had no perceptible effect on temperature in past glaciations, it will have no effect when the planet inevitably cools again. db: Global cooling is the real problem. db: Humans do not have the energy necessary to prevent the planet from cooling. Allan says: I hope we CAN mitigate the next major continental glaciation – perhaps change albedo, etc. We have some time to sort this out before the next major continental glaciation, but almost no time before the next (lesser) natural cooling cycle, which may have already begun. db: That is why the AGW scare is so ridiculous: they are worrying about the wrong thing. Allan says: Very nice graphs and valid comments, thank you db. My frustration is that this global warming debacle was all predictable AND predicted. In a separate article in the Calgary Herald, also published in 2002, I (we) predicted imminent global cooling, starting by 2020 to 2030. This prediction is still looking good, since there has been no net global warming for about a decade, and solar activity has crashed. If this cooling proves to be severe, humanity will be woefully unprepared and starvation could result. This possibility (probability) concerns me. If I’m wrong about my global cooling prediction, I’ll just call it a projection, and get a job with the IPCC. 1. Why has every glacial to interglacial change in the last million years been accompanied by a 55% increase in atmospheric CO2? 2. Why should a post-Industrial increase of the same magnitude (i.e. up to 434 ppm) not result in an equivalent rise in temperature (i.e. at least 4 Celsius)? Unfortunately for all, just about every other legitimate climate scientist on the planet (apart from the likes of Judith Curry, Pat Michaels and Roy Spencer) thinks Professor Lindzen is indeed almost certainly wrong about this. Your appeal to authority at October 17, 2013 at 8:09 am is mistaken. The ultimate authority is nature. Climate sensitivity is less than 1.0°C for a doubling of atmospheric CO2 concentration and, therefore, any effect on global temperature of increase to atmospheric CO2 concentration only has an abstract existence; it does not have a discernible existence that has observable effects. What climate sensitivity would be in a different (e.g. interglacial climate system) is not relevant to what climate sensitivity is. Richard S Courtney: I agree that the ultimate authority is Nature; and I also agree with you that the only time that matters is now. I am glad therefore glad you decided to eschew the ‘Plants grew really big in the Carboniferous era when CO2 concentrations were much higher’ meme (i.e. which would have clearly been permissible given your ‘any-port-in-a-storm’ style of argumentation). However, leaving all of the above – and any uncertainty in model emissions scenarios – aside, there is one thing of which we can be certain; and it is this: If we continue to argue about residual uncertainty in climate science – and delay collective action to decarbonise the World’s economies as fast as possible – whatever change is going to happen will happen sooner; and it will happen faster. This will mean that humanity will have to adapt to any change sooner and faster (making it harder and, on a annualised basis, more costly). Seen in this light, further delay is a false economy and therefore irrational. 1) if unabated actions were to quell cooling ,that in and of itself would be beneficial than a minor heating of average temperatures. 2) added CO2 in the air can only be measured as beneficial based on known science. There is no scenario I know of where CO2 levels below 280ppm is optimal. There is solid evidence that CO2 levels above 400ppm is beneficial. I strongly believe that you would not give up 30% or more of your wealth to invest in high cost measures that will do almost nothing. I suggest you stop asking for someone else’s money which makes poor peoples’ poverty worse so that the world can do what you irrationally want to do based on a false pretense. Hi Mario. Thank you for responding in kind. I would very much like to see you justify any of your claims by reference to peer-reviewed science. The vast majority of active researchers have concluded that – given the conditions to which all life on Earth has become habituated since the last Ice Age – we are already seeing adverse consequences from a 40% increase in atmospheric CO2. A diverse range of organisations – including the US Dept of Defense, the International Energy Agency and the International Monetary Fund – have all concluded that, given the changes we are already seeing (such as a sixfold increase in terrestrial icecap melting and a tenfold increase in glacier retreat rates over the last 20 years), further delay in substituting the use of fossil fuels (in every possible process) will be uneconomic because it will cost more in future to achieve the same result. Those organizations, though, reached their conclusions through applications of the equivocation fallacy ( http://wmbriggs.com/blog/?p=7923 ). Even if not actually conspiracy theory, this is not a reference to peer-reviewed science. N.B. Dismissal of peer reviewed science definitely is conspiracy theory. Your claim that “this is not a reference to peer-reviewed science” is false. The reviewer was William M. Briggs. Briggs holds an MS in atmospheric science and a PhD degree in mathematical statistics. He is a practicing statistician and an adjunct professor of statistics at Cornell University. Formerly, Briggs sat on a committee of the American Meteorological Society dealing with statistical issues. Hi Mario. Thank you for responding in kind… have all concluded that, given the changes we are already seeing (such as a sixfold increase in terrestrial icecap melting and a tenfold increase in glacier retreat rates over the last 20 years), further delay in substituting the use of fossil fuels (in every possible process) will be uneconomic because it will cost more in future to achieve the same result. Martin: Please do not conflate ice cap melting as proof that CO2 is responsible. You need to provide evidence, which you have not. Your interpretation of what “he said, she said”, is not proof. “1. Why has every glacial to interglacial change in the last million years been accompanied by a 55% increase in atmospheric CO2? With the greatest of respect, Mario, I conflated nothing. The exponential increase in rates of melting ice and glacier retreat in the vast majority of locations – despite a hiatus in surface warming caused by a range of natural cooling forces – can only be explained by there being a much greater anthropogenic warming force. This is not “he said, she said” – this is the logical conclusion of the vast majority of genuine experts; and your rejection of this consensus can only be justified by asserting that the vast majority of experts are either dunderheads, delusional, and/or deceitful. Given the widespread evidence of ongoing change to which I just alluded, such an assertion is irrational, improbable and/or implausible. Your “vast majority of genuine experts” draw their conclusion from an equivocation thus being guilty of the equivocation fallacy. Proof of this assertion is available in the peer-reviewed article at http://wmbriggs.com/blog/?p=7923 . Mario Lento was right when he pointed out to you that atmospheric CO2 concentration follows temperature at all time scales. Hence, your assertion of causation was dubious at best. You seem to have abandoned that assertion and have posted the comment which I have here quoted in full. There is not “exponential increase in rates of melting ice and glacier retreat in the vast majority of locations”. And if there were then so what? The formation and retreat of glaciers is predominantly a function of precipitation. It is NOT a result of “a much greater anthropogenic warming force” whatever you mean by that. As you admit, global warming has stopped. How does that happen if atmospheric CO2 concentrations dominate the climate system and the rise in atmospheric CO2 concentration has continued unabated? If you want to call the minority of scientists who accept the assertions of the IPCC are “dunderheads, delusional, and/or deceitful” then that is your choice. Some of them certainly are some or all of those things, but not all. “Ongoing change” is normal. The world always has changed and always will change. There is no evidence – none, zilch, nada – that emissions from human activities are causing global changes. The global warming scare is so last century. I suggest you move on to the next one. Martin. Telling me “He or she, or they” believe something is not proof that CO2 must be the cause of some ice melting somewhere. If you can tell me where the evidence is that show CO2 must be melting the ice, you’d be headed in the right direction. Thus far, you again are basing your “opinion” on he said she said. As far as I know, no one in the world has been able to show that CO2 has caused the temperature increase that stopped 17 years ago. richardscourtney: Thank you for helping to keep me on track here! Same with others who respond to what I write including dbstealey. …your rejection of this consensus can only be justified by asserting that the vast majority of experts are either dunderheads, delusional, and/or deceitful. If it were not for logical fallacies, Martin Lack wouldn’t have anything to write. His comments are full of fallacies like that. The strawman fallacy quoted above assumes only three possibilities, when in fact there are as many possibilities as there are scientists. For example, a 50-year old professional who wants an upcoming promotion may well sing in tune with the cAGW choir, rather than publicly admitting what he really thinks. As we know, people have been fired for expressing skepticism about runaway global warming. Why has every glacial to interglacial change in the last million years been accompanied by a 55% increase in atmospheric CO2? As Mario Lento observes, past rises in CO2 have always followed rises in temperature, on all time scales. This decisively falsifies Martin Lack’s argument, in which he appears to believe that ∆CO2 causes ∆T. It does not, as real world observations show. Why should a post-Industrial increase of the same magnitude (i.e. up to 434 ppm) not result in an equivalent rise in temperature (i.e. at least 4 Celsius)? That is yet another false statement, as the OISM Petition makes clear. In fact, Dr Roy Spencer gives a climate sensitivity estimate for 2xCO2 of 0.46ºC. Drs Idso [3 of them] estimate 2xCO2 at ≈0.37ºC. And Dr. Ferenc Miskolczi gives an estimate of 0.00ºC per doubling of CO2. The reason there is such a wide disparity in sensitivity estimates is because the effect of CO2 on temperature is simply too small to measure. The rise in CO2, from both natural and manmade sources, has not caused any measurable global warming. The divergence over the past seventeen years has made Martin Lack’s doomsday predictions laughable. Because Martin Lack’s facts are incorrect, he arrives at an incorrect conclusion. His fixation on an incorrect mechanism results in the fallacy of argumentum ignarus res, or argument in defiance of facts. Future generations will wonder in bemused amazement that the early 21st century’s developed world went into hysterical panic over a globally averaged temperature increase of a few tenths of a degree, and, on the basis of gross exaggerations of highly uncertain computer projections combined into implausible chains of inference, proceeded to contemplate a roll-back of the industrial age. Martin Lack is the quintessential Chicken Little. He believes the sky is falling, when it was only an acorn that bonked him on the head. Even if he comes to his senses, he cannot admit it at this point, because of his hysterical doom and gloom predictions that he constantly trumpets. If it can be shown that Mr. Lack has made any predictions I’ll be quite surprised. That there are predictions from Mr. Lack or anyone else implies the existence of events underlying a climate model of some kind but in a search lasting more than four years, I’ve been unable to find any such events. Rather than finding events, I find applications of the equivocation fallacy that make it sound to dupes as though there are events when there are none. As Mario Lento observes, past rises in CO2 have always followed rises in temperature, on all time scales. Clearly this has not been true for the last 17 years if the original post is to believed “we have had 17 years without warming”, during which time the CO2 has increased by 30ppm. Emphasis on “always”, instead of where it should be, on: “followed”. Martin Lack: dbstealey laid out some simple 1+1=2 facts that are not argued. 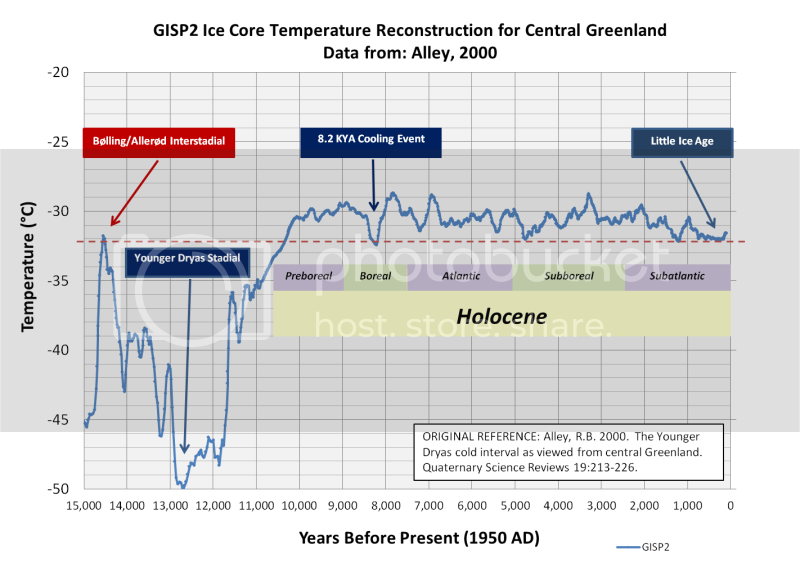 Please go do some research and look at ice core sample data overlaid with CO2 levels over time scales and see for yourself and then reassess what you believe. You can either choose to ignore the data, which is what the people controlling your mind want you to do in their quest to create useful idiots, and look foolish or check them out and try to do some basic research. Your ilk remind me of the people who were so sure others were witches and forced people to be hanged –just like your ilk intends to force people into poverty believing in the tripe of CO2 = CAGW. They had your same conviction, but failed to do the basic research needed to escape ignorance. People like you look for answers that confirm your ignorant rants. You’ve been given the chance to grow and learn. That you choose to be lazy and ignorant is a sign you don’t know 1+1=2. You appear to have a reading comprehension problem! You said:”As Mario Lento observes, past rises in CO2 have always followed rises in temperature, on all time scales. On the time scale of the last decade the rise in CO2 has not followed a rise in temperature. @Phil – Uh yes it has. Temperatures did INDEED rise from 1980-1998, and CO2 has risen since. Phil: I agree with you, that there is not a good correlation in the chaotic system. However, past history shows on all longer time scales where significant changes in climate match CO2, there is a correlation lag. Noise in a system can be misleading, as was the short term rise in temperatures from the 70’s through the 90’s while CO2 was going up. So now instead of cherry picking, Phil. is nit picking. No just correcting your misleading statements! And your response is to produce graphs with dodgy axes which actually support my point. You graph shows a period of zero growth in T plotted with consistently growing CO2, different zero points on each axis to make the difference look smaller. Throwing out random badly drawn graphs with no attempt to explain their relevance is not particularly useful. “the minority of scientists who accept the assertions of the IPCC “ – Richard S Courtney. I really cannot be bothered to respond to most of the BS posted by people on this website. However, given Courtney’s expertise as a meteorologist, this must surely be a willfully deceptive statement. The relevant test is not whether the vast majority of the World’s scientists accept what the IPCC says. The relevant test is whether the vast majority of relevant expertsaccept it. However, this is tautological because the IPCC is an international body tasked by the UN to analyse and summarise the opinion of those experts. Since our governments try very hard to neutralise the impact of IPCC reports, rejecting their findings can only be justified by belief that the genuine experts are simply trying to perpetuate their research funding. I gather that the Lack method of investigation differs from the scientific method of investigation in drawing conclusions by majority vote of Lack-picked experts. Under the scientific method, one draws conclusions through application of logical principles. That’s right, Terry. If all else fails, resort to mockery. I did not choose the experts; but neither do I reject them simply because they tell me what I don’t want to hear. I am probably more conservative than you are in many respects, but I do not allow my ideological bias to prejudice my attitude towards scientists. My comment was entirely logical; and the truth is you can’t cope with it. Terry Oldberg: Anyone who can glibly dismiss the IPCC as pseudo-scientific “experts” does not deserve to be taken seriously. You are right about Martin Lack. He has no concept of the Scientific Method. He simply does not understand it. And as for ‘logic’, Mr Lack lacks any understanding of it.